Pricing auction items is not a perfect science, in fact it can be quite tricky. Justify pricing by including lots of photos and lively descriptions. The key is finding the sweet spot that will initiate interest and bid donations up and up. Remember, almost all auction items are donated so any income is considered profit; fundamentally the higher the final bid the greater the philanthropy. Auctria program makes pricing process uncomplicated and orderly. Each item is loaded individually to be properly be described, categorized. A photo of the auction item and a logo of the donor are basic functions of Auctria but crucial to gaining enthusiasm and initiate the bidding process. Auctria options for pricing simple and flexible. 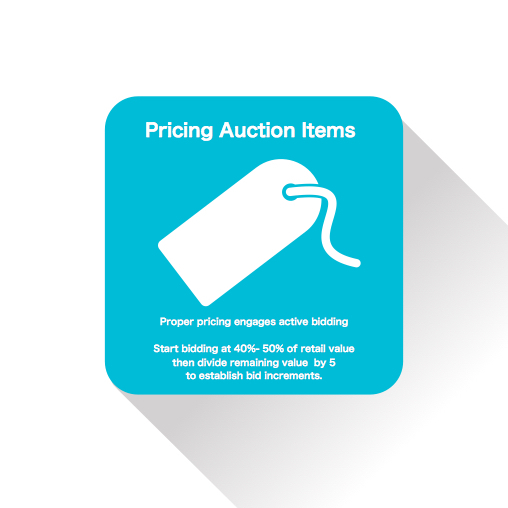 Choose either a pre-programmed pricing policy OR individually price each item, add in the anti-sniping feature for give additional opportunity for higher bids. Prevent bid sniping by last minute bids outbidding people before they have a chance to react. Under Website -> Online Bidding are two new options to specify an anti-sniping trigger window and an anti-sniping extension. Any bid placed within the trigger window will cause the closing time to be extended by the amount of the extension period. Using a hybrid of both methods can cut work time too. Set the standard pricing structure then go back and tweak the non-standard items. Bid Sheets need to match the pricing strategy. Bid Sheets need to include: auction item name, auction item number, next bid increment and any combination of bidder name, bidder number, bidder email. Bid sheets need to look neat and professional. General rule of thumb for pricing for ordinary goods and services is START the bidding at about 40-50% of the retail, then divide the remaining value by 5 to engage a typical back and forth bidding exchange. Yummy Restaurant donates a $100 gift certificate. Auctria has a built in all-auction pricing policy saves time and by setting the starting bid, minimum bid increment and 'buy it now' price for your silent auction items making this part of the process quick and easy. Unique goods and services or those that have a high value can be speculative. Start too high get and risk no bids, start too low and close at an undervalued price. START the bidding at about 40%-60% of a realistic retail value, then divide the remaining value in bite sized chunks to quickly elevate the donation. High Value items do well at live auction too. Live auction permits impromptu modifications. If the starting bid gets no activity the auctioneer can immediately lower the starting bid and adjust accordingly. Tailor items that are one-of-a-kind keepsakes or local and priceless experiences. Exclusive auction items will garner interest to the overall event as well as the auction item itself. Keep in mind the past buying practices for starting bids. Do create the image of exclusivity. Do create in the description lots of details. Do create in the description how bidding on this auction item will delight the buyer. Don’t be apprehensive to start these a bit higher on these too. Don’t start the the bidding at last year’s final sale price either- leave room for the bidding process to start and flush out. Keepsakes: Consider with a keepsake is it ‘valuable’ to only a subset of the audience ie. Mrs. Smith Classroom parents. If this is the case start the bidding on the higher end, but with smaller increments to draw bidders into the action and remain captivated. To capitalize on the rarity of the item the description should be detailed and play up the sentimentality. If there are multiple types of keepsakes ie school projects try to be consistent with the starting bid and let the market forces dictate the natural flow of bidding. Priceless items are those that truly do not have a retail value but do have an utility or emotional value. For instance upfront reserved parking, front row at an event, or an opportunity that is out of the ordinary like Principal helper for the day. The priceless opening bid can be in the higher range. The bid increments should also be a bit larger in relation to the general goods. The total number of bidders for priceless items tends to be lower so make each bid increment count. Priceless Quick Tip: Auctria features a PRICELESS category and pricing for such activities. The Value of the item that should be displayed publicly. You can enter -1 to categorize the item as Priceless. the priceless items can stand alone for marketing purposes. Keep in mind that this information is based on past auction experiences however it is only a guide. The basic principle to stay consistent in auction item types should yield success!